Persistence Market Research uses a unique research methodology which is a strong blend of secondary and in-depth primary research. Extensive primary interviews with key market players, stakeholders, market observers and experts are carried out to collect necessary data and information pertaining to various segments and across key regions. The data crunching and statistical analysis so performed undergoes multiple layers of validation to garner appropriate market insights which could benefit business by impacting critical decisions. The exhaustive research methodology has been applied to thoroughly understand and study the market for crustaceans and the findings and insights have been skilfully crafted following a systematic structure in the new report on crustaceans market. The market research report on global crustaceans is a comprehensive market research study which focuses on the global scenario and provides actionable acumen on various factors which influence the market which is possible with the help of strong data and statistical analysis. It delivers an unbiased view of the market by including analysis on various market segments across the major geographies of North America, Latin America, Europe, Asia Pacific and Middle East and Africa (MEA). The global research report on crustaceans market has an in-depth weightage on statistics, figures, numbers and graphs which is based on a clear market definition. This will enable the reader to take informed decisions with the help of well-furnished insights. The upcoming trends and developments, new innovations in products and varying product portfolios, new acquisitions, end user analysis and much more actionable acumen give a 3600 view to the market ultimately providing the reader with necessary tools to devise strategies in order to establish firm grip in a particular region or in a particular segment in the global crustaceans market. The global crustaceans market research study covers competitive landscape that includes market shares, revenues, growth strategies applied, product portfolio analysis, distribution channels, expansion in several geographies, marketing strategies, SWOT analysis, pricing analysis, etc., of the various key players in the global crustaceans market. Such an intelligence framework can be used to gain competitive advantage in the long run, especially helpful for new entrants in the crustaceans market. Crustaceans are a group of invertebrate aquatic fauna consisting of many species. Crabs, lobsters, crustaceans, krill, crayfish, prawns and wood lice are the best known crustaceans. Nearly half of the world‘s total production of crustaceans are produced in China alone. They are majorly consumed as food throughout the world. Crustaceans find wide ranging applications across industries such as food industry, pharmaceutical industry and cosmetic industry. Due to numerous health benefits, crustaceans are finding increasing adoption in the food industry in the form of fresh food, frozen food and even snacks. In the cosmetic industry, crustaceans hold high value. They contain natural compounds that are beneficial for skin tissues. According to the analysis done by Persistence Market Research, the global crustaceans market is experiencing steady rise since past years. The global market has witnessed positive yet slow growth since 2012 and is expected to register a moderate value CAGR of 4.5% throughout the period of forecast. In 2017, the global crustaceans market reflected an estimate of around US$ 104 Bn and is anticipated to touch a value higher than US$ 147 Bn by the end of the year of assessment. This growth can be attributed towards increasing demand for fresh and frozen sea food, rising per capita income coupled with higher consumption of fish and sea food products and increasing awareness regarding health benefits associated with the consumption of crustaceans. Crustaceans market at a global level is directly influenced by different distribution channels used for selling various types of crustaceans. Direct and indirect distribution channels are discussed in this research report. The indirect distribution channels are expected to reflect high potential as they have largely contributed to the growth in revenue in the global crustaceans market. Moreover, the sales revenue generated by indirect distribution channel surpasses the revenue generated by direct distribution channel. The revenue from indirect channels was around US$ 64 Bn in 2017 and it is expected to grow at a steady rate to reach an estimate of over US$ 89 Bn by the end of the year of assessment (2025). The indirect distribution channel segment is projected to grow at a CAGR of around 4% throughout the forecast period. The indirect distribution channel in the crustaceans market is further categorized into modern trade, convenience stores, online stores, fish shops and others. Of these, modern trade has shown higher contribution to the growth of the parent segment and hence the global market. The modern trade segment dominated the global market since past several years and is expected to do so in the future. 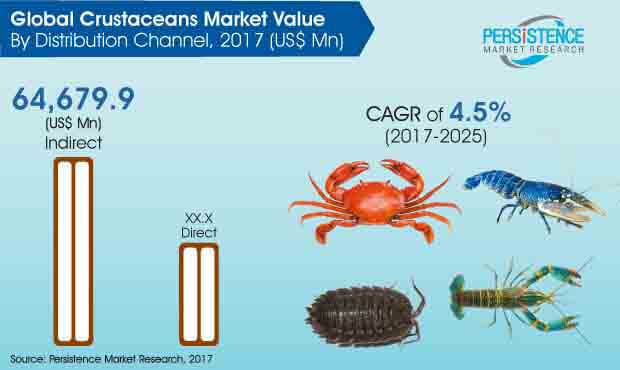 The revenue generated from this indirect channel is expected to be the largest and hence it holds high market share in the global crustaceans market. The revenue from modern trade is expected to touch a valuation of more than US$ 29 Bn by 2025 end and this sub segment is projected to grow at a moderate rate in the years to follow. The online stores sub segment is projected to showcase higher growth rate in the coming years. This can be attributed to the increasing inclination of individuals towards using online sales channel. The online stores sub segment is projected to expand at the highest rate to register a value CAGR of 5.2% throughout the forecast period. The growth of the global crustaceans market is spurred owing to online sales of crustaceans at a global level.